Jennings is available at a special discount price as part of our Jennings & Jennings Mk2 bundle. See our Hot Deals page to grab this offer. 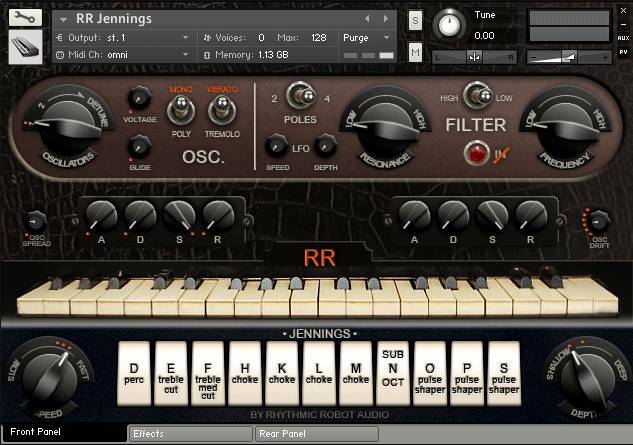 Jennings is a meticulously faithful recreation of one of the very first synthesisers, the valve-based Jennings Univox. The Univox was designed in 1946 by Derek Underdown and Tom Jennings, who went on to create Vox amplifiers and define the guitar sound of a generation. It was manufactured in the 50s and 60s along the same lines as its contemporary, the Clavioline, as a gigging keyboard for bands to use to supplement the basic acoustic piano that most pubs and clubs offered. To this end it was designed with portability in mind: it had its own onboard amplification, and packed into its own suitcase for transport, while the keyboard portion of the synth was detachable and designed to fit just under and in front of a piano keyboard. It generated a rich, warm, analogue wave (more or less a sawtooth) which could be processed, adjusted and filtered using 12 “tabs” along the front of the keyboard. These were not simply organ stops; they altered the base waveform rather than adding to it (with the exception of Tab N, “Sub Osc”, which does add a sub-oscillator). Some tabs engaged filters or tilt-EQs; some clipped the waveform or otherwise distorted it; some added or enhanced a percussive transient peak for greater definition. Using different combinations of these tabs, over 2000 different voicings could be created (before factoring in vibrato settings! ), while a knee-lever controlled the output volume on the fly for a surprisingly expressive playing experience. Vibrato (three speeds, two depths) added movement to the sound, while a transpose knob allowed the three-octave keyboard to access five octaves of range. The Univox’s own speaker cabinet contributed greatly to its tone, and the sound could be varied between sweet and singing and raw and raucous with the flick of a couple of tabs and the twist of a dial. What’s beyond doubt is that the Jennings Univox was one of the very first pioneers of synthesis, combining the valve tone-creation circuitry that had marked out earlier classics like the Hammond Novachord with a far more portable, band-friendly form factor and the instant satisfaction of its tab switch tone controls. We found our Univox at an auction, and were instantly entranced by it. Everything from the crocodile-skin case to the thick, heavy rubber cables carrying lethal voltages back and forth between the keyboard and the cabinet just made us fall in love. The enormous Bakelite chicken-head knobs; the little glowing power lamp; the toggle switches; and that rack of inscrutable tabs (A? D? F? H? What did they mean? What had happened to B, C, E and G? If you really want to know the answers to these key questions, visit Creating Jennings.) Anyway, it was all just too wonderful to pass up. So we bought it like a shot, and have spent the past several months meticulously and exhaustively recreating it in software. First of all we had the entire unit professionally overhauled and checked by Ben Rossborough of Cyberwave EMS. Ben made sure that all the valves and capacitors were happy, that the electronics were making sense, and that the keybed was levelled. Meanwhile, here in the lab, we set about doing some Scooby-style detective work to find out what exactly all those cryptic letters meant, and how the thing was supposed to work. By the time it was back in our hands, we were good to go. We spent many happy hours sampling tab combinations and analysing spectral plots of the Univox’s output before embarking on a mammoth sampling process. Each note sample used in Jennings is around 20 seconds long, in order to preserve the rich and varying valve tonality of the original; and we sampled the keyboard chromatically across its entire 5 octave range. Because sampling every single tab combination in this way would have resulted in well over 240,000 samples running to many terabytes, we adopted a dual technique of sampling and convolution processing to recreate the Univox. Basically, the simpler tabs – like the “treble cut” filter – engage Impulse Response convolved models of the Univox’s valve processing, while tabs like the P (which clips the waveform) or K (a much warmer tone, with a percussive attack) were sampled both individually and in combination. (So there are sample sets for tab K, tab P, tabs K and P together, and so on.) This way, we’ve ensured that Jennings sounds and responds extremely faithfully, recreating the Univox’s character to an exacting degree. Once the samples were on our hard drive, the first thing we did was to make the monophonic Univox fully polyphonic. That was a no-brainer. You can switch to mono, of course, for basses and leads; but when played polyphonically Jennings really comes into its own, since every note brings its own inherent instabilities and variations to the sound – instabilities and variations which you can enhance using the “Osc Drift” control if you wish. We also doubled up the number of oscillators. Switching the OSC panel’s big chicken-head knob from 1 to 2 kicks in a second sample set in unison with the first, thickening and warming the sound hugely. (These aren’t simply the same samples duplicated, but different samples, so there’s no sterile chorusing or phase cancellation; instead you get the real deal of feisty analogue goodness!) Twisting the knob further detunes the two oscillators progressively, while the “Osc Spread” control further down pans them for subtle or extreme stereo widening. Full envelope control, a glide amount knob for portamento, inbuilt saturation to introduce extra valve distortion, and the option of Tremolo instead of Vibrato round out the OSC section. The FILTER offers high- or low-pass, 12dB/octave or 24dB/octave resonant filters with envelope control and a dedicated LFO routed to cutoff. This section massively expands the palette of tones you can source from Jennings: just dial up a good raw tone using the front tabs and then filter it and shape it just like in any conventional subtractive synth. Add some effects from the Effects pane, and a whole world of glorious valve-infused sound is within easy reach. Used in this way Jennings works and feels like a familiar subtractive synth, with the vital difference that instead of selecting a sawtooth or square wave to start with, you select a tab combination. Most analogue synthesisers offer only a handful of starting oscillator waveforms – maybe 3, 4 or 5 if you’re lucky. Jennings offers you over 2000 – and every single one of those waves has as its root DNA genuine valve tones from over seventy years ago. Rounding out the sound-sculpting possibilities we have five effects processing blocks, accessible on the Effects pane. Chorus, Phaser, Delay, a Rotary Speaker control, and an amp cabinet simulator, can all shape Jennings’s sound either subtly or radically. Very importantly, this is also where you find the “Mod Wheel Controls Volume” toggle switch. With this active, you can use the modulation wheel on your controller keyboard to simulate the Univox’s knee lever and create expressive fades, swells, wobbles and jumps as you play. It’s a central component of the authentic Jennings tone, and works particularly well for pads and leads. Of course, part of the fun of owning a synth like Jennings is not using all the wonderful effects and filters we’ve added, but going back to grass roots and treating the software as if it’s the real hardware: creating the same tones that George Harrison or John Lennon might have dialled up back in the Cavern. To make this process as transparent as possible, we’ve included a kind of “authenticity compliance mode” in Jennings. Simply click on the Rhythmic Robot “RR” logo just above the keyboard, and a host of little red dots and markers will spring up. These indicate which controls should be switched off (e.g., the FILTER section, the Effects, and so on), and, for controls that are in use, where to set them (e.g. the Vibrato Speed can be set to any of the three positions shown; its Depth to either of the two positions shown). By following this trail of breadcrumbs you can set Jennings up to be entirely 1946-authentic, and then use the tab switches to create synth tones that would sound identical to those coming from a real Jennings Univox. So, whether you want authentic tones from the early days of synth history, or brand-new creations that still have that warmth and glow to them, Jennings delivers. Cutting edge sampling and convolution techniques bring valves from seventy years ago back to life and put them right there in your DAW, ready to bathe everything in an amber glow (and a faint smell of warm crocodile skin). This is what synthesisers sounded like back at the dawn of an era. And you know what? They sounded good. (All our Kontakt instruments require a full copy of Native Instruments Kontakt v4.2.3 or higher (including all versions of Kontakt 5). Kontakt Player is not supported: instruments will load, but will time out after 15 minutes. See the FAQ for further information.) 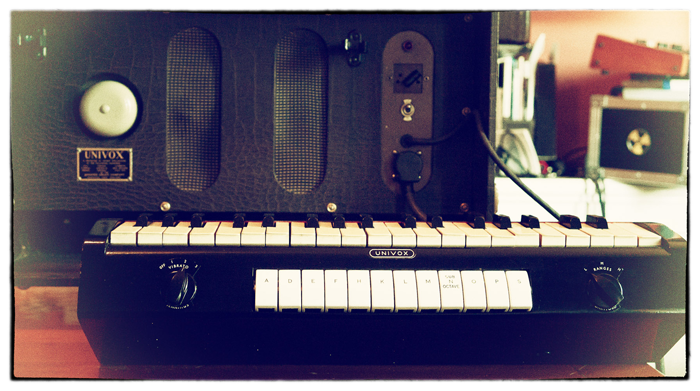 You can read a bit more about the history of the original Jennings Univox valve synth here. 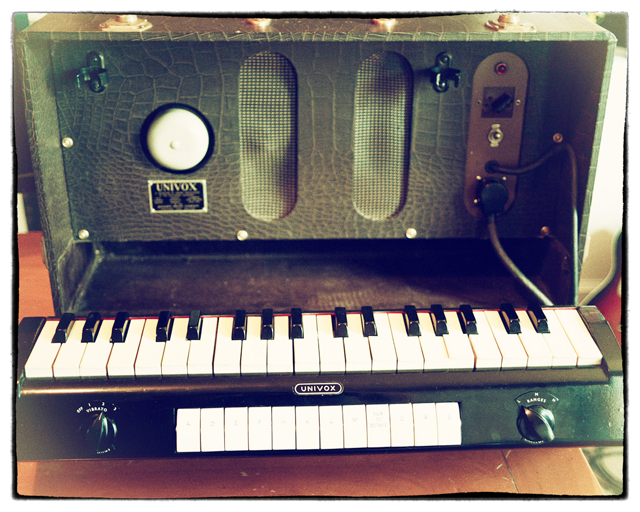 Discovered this beauty as I was hunting for something to help recreate some 60’s tunes. Very glad I found it. Plus, I have used it in more contemporary recordings to great effect. Wonderful stuff!! An absolute MUST for pre-70’s sounds! Spacey, creepy, melancholy, quirky … Jennings is a MOOD MACHINE! A unique sounding analog instrument. The tube based sounds let one paint from a broad palette–clean, singing tones through dark, angry distorted growls can be coaxed from this simulacrum. You will remember sounds from many of the old sci-fi and horror movie soundtracks if you diddle around on this instrument. I was obsessed with emulating the intense lead sound of the original ‘Telstar’ hit record from the early 60s. Here it was! The Jennings has the kind of cut-through, with rough analogue edges and genuine mustiness, you just don’t get with the usual bank of synths.